I was sponsored by Logos Trading Post to review their product and am excited to share my experience as well as an awesome giveaway! All opinions are mine alone. For more information please read my full disclosure. Christmas time is quickly approaching. Where do you go to grab your Christmas gifts? Do you run up to the local mall and grab the newest "it" item? What kind of meaning does that really hold? Or do you go looking for some good, meaningful Christian gifts? I remember growing up and going to the local Christian book store with my mom. We would spend hours in there, checking out the books, and gifts. I remember spending my time finding books, a comfy spot and getting so hooked in the books that I just had to have them for my own! Now that I have grown up and heading out to buy presents on my own, I love to keep looking for Christian gifts for those who I buy for. This is something that I love to do, and I found the jackpot when I found Logos Trading Post. Logos Trading Post has numerous gifts that are great for those you love, or for yourself! They have items like Christian rings, mouse pads, coasters, home décor, DVDs and even bookmarks. Oh, the bookmarks! I was lucky enough to get one of the bookmarks, and I was surprised at how beautiful it really was when I opened the package! The bookmarks are made in Turkey, yes Turkey. Turkey is where all those gorgeous handmade rugs are made. Can you picture them? I can, every time I look at the bookmark. 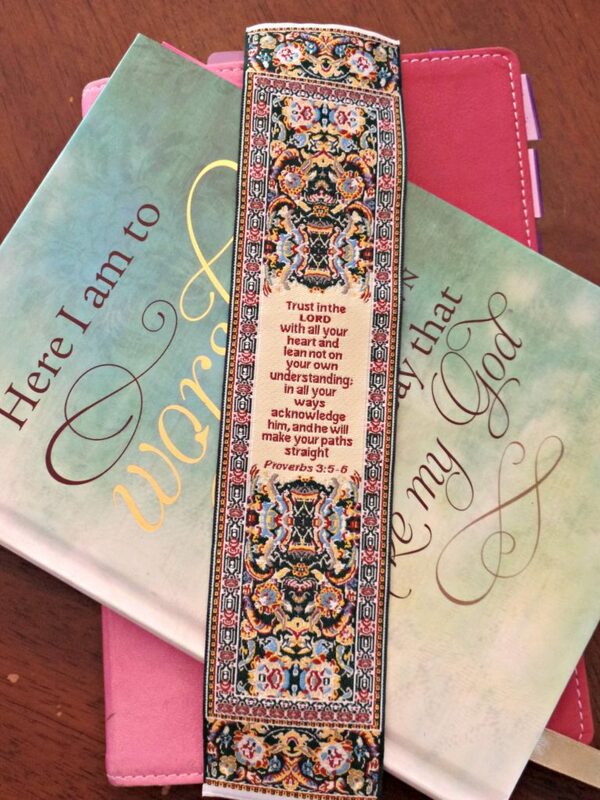 This simple little bookmark is like a small piece of a rug that was made especially for me! 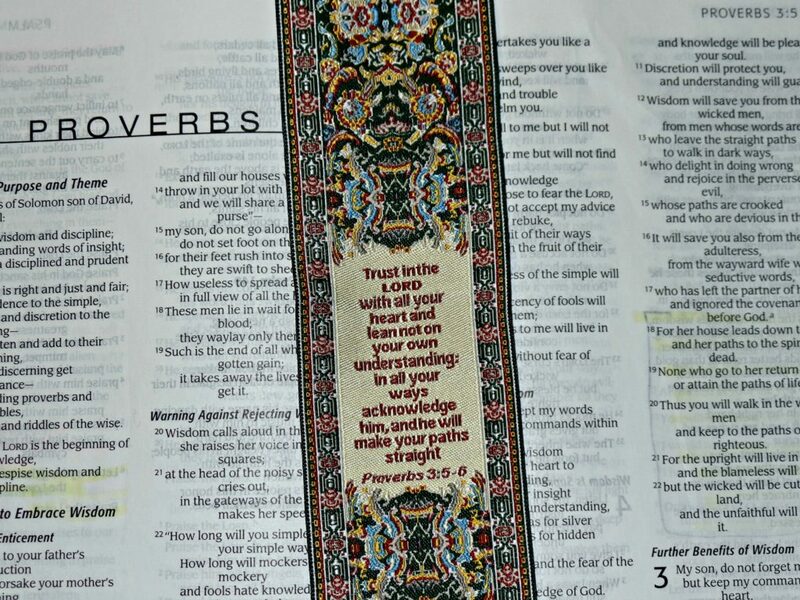 I received the yellow, Proverbs 3:5-6 bookmark. This was a verse that spoke straight to my heart. It is funny how He works like that. This was something that I need to remember and have had a hard time remembering. Only now I get to remember every time I open my bible. 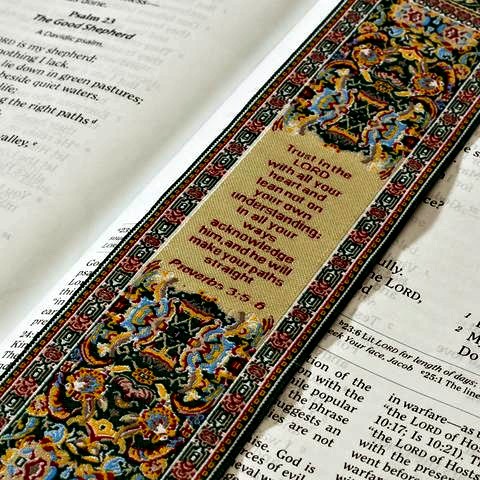 I have loved having this bookmark in my bible. Opening my bible every day and seeing this bookmark has made me slow down and think about this verse every day. Who doesn't want to think about trusting the LORD every day? Are you still looking for that perfect gift with the meaning that you want to give? Head on over and check out all that Logos Trading Post has to offer! After you have done that, check back here and enter yourself into this super awesome giveaway! Logos Trading Post Gift Set Giveaway! We're giving away a gift set including a Necklace, Logos Pad, Bookmark and Coaster set worth $46! To enter, simply fill in the Rafflecopter below. Not only do I have a giveaway for you, but if there are some things you want from Logos Trading Post and you just can't wait, you can get 25% off your order with the code 25BMED and FREE shipping for orders over $40! Are you local to me? Do you live in East Central Minnesota? Guess what, you don't have to wait! Logos Trading Post has an office centered in downtown Mora, MN! What is your favorite item from Logos Trading Post? I can't wait to add more to my collection!